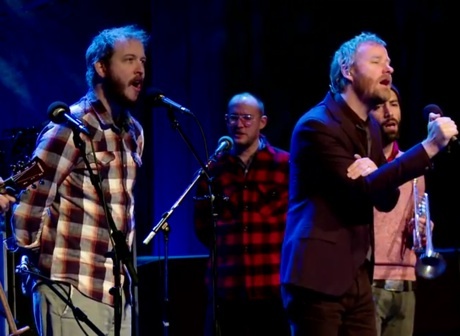 Yesterday (December 8), two big-name indie acts stopped by the studios of our national broadcaster, as Bon Iver and the National appeared on the CBC Radio show Q. Not only did the National use this opportunity to play the two new songs we heard yesterday, but they performed High Violet cut "Vanderlyle Crybaby Geeks" with some help from Bon Iver main man Justin Vernon. Much to the delight of the studio audience, the plaid-clad singer leant his angelic vocals to the mournful tune. With its dual acoustic guitars, purring horns and stirring harmonies, this one is a tearjerker for sure. Watch the performance below, and scroll down to check out host Jian Ghomeshi's 18-and-a-half-minute interview with Bon Iver.